Niantic announced that a new event is coming to Pokemon Go in celebration of the September equinox. The event will take place from 1 p.m. PT Sept. 22 until 1 p.m. PT Oct. 2. 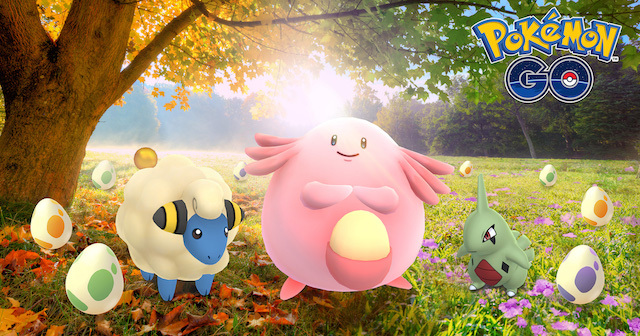 As part of this event, players will be able to collect special 2km eggs from PokeStops and Gyms, which have the chance to contain Chansey, Mareep, Larvitar and more. In addition, during this event, players will receive double Stardust for catching Pokemon and hatching eggs, and they’ll also receive three times the normal amount of experience points when they register a new Pokemon to their Pokedex. Finally, for the duration of this event, players will be able to purchase special boxes from the in-game store containing items such as Lucky Eggs, Lure Modules and Super Incubators that hatch eggs 1.5 times faster than normal. Pokemon Go is available to download for free on the iTunes App Store and Google Play. The game has been downloaded more than 750 million times, and it has driven more than 500 million visits to sponsored locations, such as Starbucks restaurants, since its launch in July 2016. Recently, Niantic partnered with Wieden + Kennedy London to launch an advertising campaign for Pokemon Go in major worldwide cities. For this campaign, billboards containing gameplay stats appeared in New York, London and Tokyo, and some of these billboards were activated as in-game PokeStops.